New Delhi (Web Desk) : Bollywood's 'Tanu' or 'Datto' aka 'Queen' star Kangana Ranaut, who has proved her mettle in the industry and has made a special place for women oriented films in Indian Cinema with her scintillating performances in films like 'Queen', 'Revolver Rani' and many more, has quipped she is open to walking down the aisle more than once in her life. The 29-year-old actress whose personal life has been in the spotlight since her entry into Bollywood, feels there’s nothing wrong in getting married again if things don’t work out. While interacting with the media as a showstopper for designer friend Manav Gangwani at the India Couture Week, the actress said, “Manav and I were talking about my wedding. I told him for a first wedding for sure, I will wear his design.” This was the second time the three-time National Award winner walked for Gangwani, who presented his collection, Begum-e-Jannat. 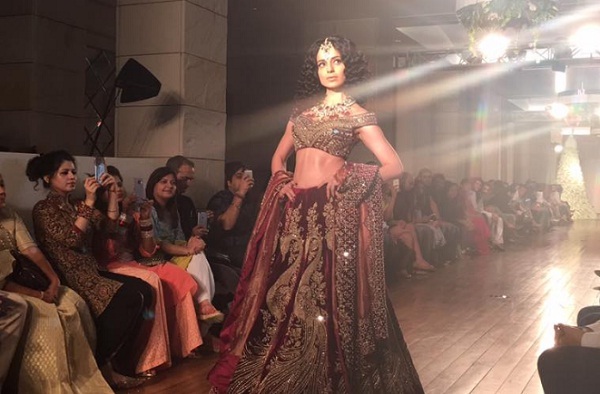 Kangana glowed in a golden-burgundy lehenga-choli. The open hair, bright makeup, and other accessories enhanced her look. “My collection is an ode to a dear friend, I lost recently. I narrated the idea and the collection to Kangana and she is all about friendships. So, she agreed. I have been friends with Kangana since she began her career. She is special,” Gangwani said. The designer added he was happy to have Kangana’s support on the occasion that marked the debut of his label Manav Gangwani India. The actress, who has earlier collaborated with high-end brands for western women wear, expressed a wish to venture into designing Indian silhouettes. Meanwhile, Gangwani’s collection was an amalgamation of sentiments evoked by the word Jannat, meaning paradise. The palette for the creations featured ivory as pure, blacks, royal navy, emeralds and wine. Accentuated by the timeless Zardozi handwork in antique vintage gold to add that touch of royalty, every garment seemed to have thoughtfully crafted to induce the fragrance and grandeur of times gone by. The designer said the collection epitomizes the essence of every woman, which is timeless, romantic, demure, yet elegant with an undertone of drama and mystery.